Guitarists love to quote specs. We use them to compare amps, guitars and components and — often erroneously — to paint a mental picture of how we assume a piece of gear will sound even before we have plugged it in. Even with close-focus details like pickups, we like to apply the numbers to draw what we assume are logical conclusions about performance and tone. But in order to get anywhere with such exercises, we need to understand what the specifications really mean and, perhaps more importantly, what they don’t. The most important stats relating to pickups often can help us paint a rough picture of how they will sound, at least relative to others of the same type. Misapplying these same numbers, however, often will lead to disappointment in our tone-tweaking efforts. Before proceeding, be aware that this is the fourth part in a series that seeks to give you an in-a-nutshell view of why different pickups sound and perform the way they do. The bulk of the significant factors are covered in Pickups Primer Pt I, an overview of the two major templates of pickup types; Pt II: The Makeup of the Coil; and Pt III: Magnet Type, Structure and Use. This one is mainly some icing on the cake, providing a real-world means of handling the specs that you will often see attached to these devices. Please note that in an article of this length, or that of any articles in this mini-series, there is no way to offer a comprehensive “tone guide” to all of the individual pickups out there. Search the number of pickup makers working today, large and small, and multiply that by the number of different models they offer, and you’ll quickly understand how futile such an exercise would be. Even the best effort to do so would very likely leave out the specific pickup you happen to be interested in. But that’s the very point of these four Pickup Primer blogs: to break down and describe the important factors, components, designs and specifications relevant to any type of pickup. Learn these, and you’ll leave with a decent understanding of how it is likely to sound. “Resistance” is the measurement, taken in units called “Ohms,” of a coil’s opposition (or “resistance power”) to a DC current. The same measurement of an AC component is called “impedance,” and it is also recorded in Ohms. Look up the specs of almost any pickup and you’ll see a figure for resistance, which is intended to tell you how “powerful” the pickup might be. For a Stratocaster pickup, for example, it might say 6.2k Ohms (where “k” means “times a thousand,” or 6,200) for a more vintage-voiced product. 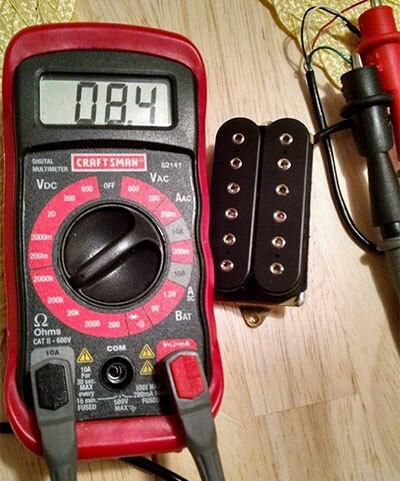 The conundrum in all of this is that standard electromagnetic guitar pickups create an AC signal, but we tend to measure only their DC resistance, simply because this is easier to do. As such, these specs that proliferate pickup-makers’ web sites don’t do the full job of telling you how hot or powerful any pickup is. They do, however, go some way toward helping you build up a picture of the pickup’s characteristics once you know some other details and have several others with which to compare it. Essentially, any pickup’s resistance measurement just tells you how big the coil is — that is, how much wire is wound around it — or how big the two coils combined in series are if it’s a humbucker. The trouble with using this as a set standard, however, is that different gauges of wire yield different resistance readings for the same given length. 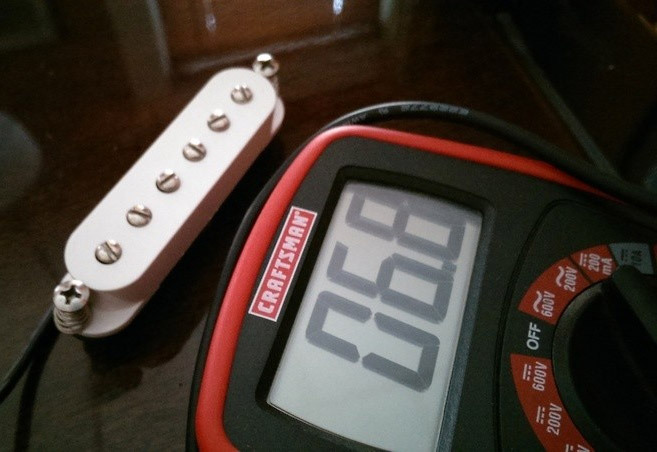 Thinner wire gives higher resistance readings, so you can be fooled into thinking such pickups are hotter. In fact, a lesser length of 43-gauge wire will yield a higher reading than a somewhat greater length of 42-gauge wire, so two otherwise similarly constructed pickups will not only sound different because of the different wire used, they will give very different resistance readings. In addition, many of the more thoughtful pickup makers will tell you that “resistance readings mean nothing” when trying to gauge the sound of any pickup, and for the most part they’re right. They do mean something, however, if you know all the other factors in a pickup’s design and construction, and are using specs for resistance merely as a gauge to judge likely nuances between one pickup and others that are constructed identically in everything other than coil size (i.e. length of wire used). To that end, any weight given to resistance readings should only be considered in light of all of the other things we have examined in the previous three installments of Pickup Primer. With that in mind, they might help to get you somewhere. 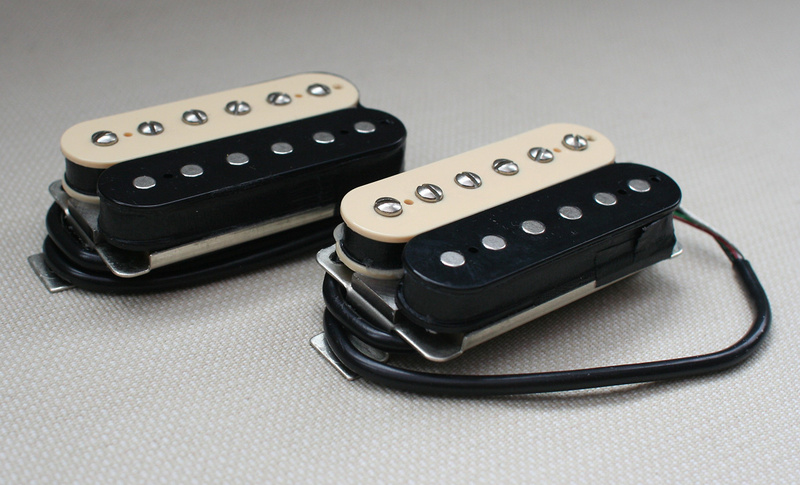 For example, consider six similarly designed PAF-style humbuckers made with the same materials. Attach six different DC resistance readings to these, and you can guess that the 6.85k-Ohm pickup might sound a little thin, bright and under-gunned in the bridge, but snappy and round in the neck. The 9.2k ohm pickup is likely to sound a little too fat and muddy in the neck, but will be meaty and thick in the bridge, and so on, with all sorts of gradations in between. Generalizing more broadly about a wide range of pickups’ power, or so-called “output,” by using DC resistance as a yardstick can be misleading, however. A pickup’s resistance doesn’t measure anything being “put out” at all, but is a static measure of its coil at rest, taken with a specially designed meter, and simply reads the number of turns of X-gauge wire that have been wrapped around the coil. More or less turns of wire in a coil of a specific design will yield a more or less powerful result, respectively, but comparing the resistance readings of a Strat pickup, a Tele pickup, a Gibson P-90, and a Gretsch Filter’Tron will get you nowhere. Even if all read exactly 6.5k ohms, they would sound very different and even exhibit distinctly different output levels, driving your amp to varying degrees. Building towards a more complete picture about the sound of any pickup, specs for resistance when used in conjunction with those for “inductance” — with an understanding of all of the other constructional elements of that pickup already in mind, as above — starts to get you somewhere. The Concise Oxford English Dictionary tells us that inductance is “the property of an electric circuit that causes an electromotive force to be generated by a change in the current flowing.” So much for the pure science. What does that mean in terms of tone? Inductance is measured in a unit called “Henries,” and to put it in simplified terms, such a reading tells us how “fat” a pickup will sound. As a general rule, the higher the inductance, the more restrained the high end, and the thicker the mids and lows. While resistance is a pure measure of how much of any given gauge of wire is wound around the coil, inductance can be affected by other things. Unusual or irregular winding patterns, metal components in contact with the magnet, coil structure and other factors can all raise a pickup’s inductance above what the raw coil might read on its own. To provide some examples, the average Stratocaster pickup will have an inductance of between 2 and 2.5 Henries, while the average traditional PAF-style humbucker will register something above 4 Henries. The average Telecaster pickup, on the other hand, will read a little over 3 Henries. Fewer pickup makers provide specs for inductance than for resistance, but it’s something that more and more people are aware of, and you can usually find it if you poke around or simply ask. As with all other specifications, though, shopping according to inductance readings is likely to disappoint or confuse your efforts to find the pickup that’s right for you. However, in conjunction with all of the other factors we have discussed (coil type and wire gauge, magnet type and position, general pickup design and construction and resistance) it gets you further toward an understanding of how that pickup might perform “on paper” relative to others that are similarly made. The only real way to know how any pickup sounds, of course, is to put it in your guitar and play it. Dave Hunter is a writer and musician who has worked extensively in the USA and the UK. He is the author of The Guitar Amp Handbook, Guitar Effects Pedals, Guitar Amps & Effects For Dummies, The Gibson Les Paul and several other books. Dave is also a regular contributor to Guitar Player and Vintage Guitar magazines. The Updated And Expanded Edition of Dave Hunter’s The Guitar Amp Handbok: Understanding Tube Amplifiers And Getting Great Sounds is now available from Backbeat Books. See some of Dave's books on Reverb here.